Acting Yang di-Pertuan Agong Sultan Nazrin Muizzuddin Shah today visited firefighter Muhammad Adib Mohd Kassim who was critically injured during a riot at the Sri Maha Mariamman Temple in USJ 25, Putra Heights, last Tuesday. Sultan Nazrin arrived at the National Heart Institute (IJN) at 9am and present to receive him was Fire and Rescue Department director-general Muhammad Hamdan Wahid. 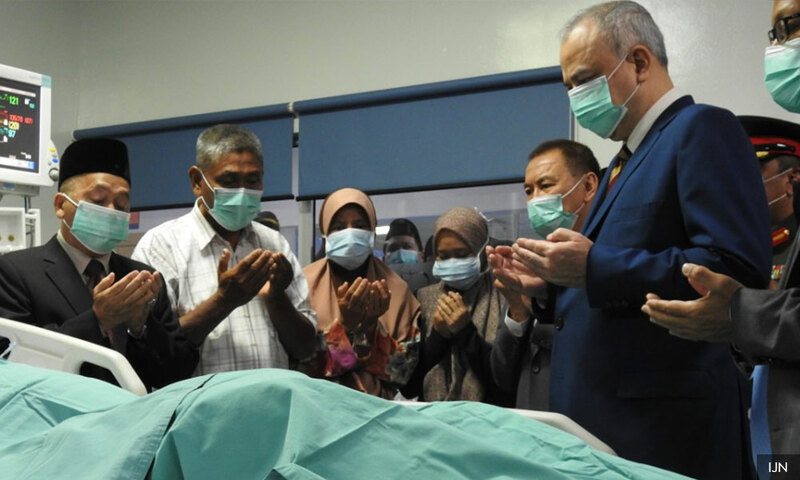 During the 30-minute visit, Sultan Nazrin was briefed by a doctor-on-duty on Muhammad Adib’s condition and also handed over some contributions to the fireman’s family. Adib reportedly woke up from his medically-induced comatose condition this morning, although he will still be kept highly sedated to allow his organs to recover. In the incident early Tuesday morning, Muhammad Adib was believed to have been assaulted by a group of rioters while responding to an emergency at the temple. Muhammad Adib who is suffering from fractured ribs and internal injuries was earlier treated at the Subang Jaya Medical Centre (SJMC) before he was transferred to IJN on Tuesday night. The fracas at the temple, which occurred about 2.30am, was stirred over the relocation of the 100-year-old temple. The riots occurred at the vicinity of the temple and the One City shopping centre. Meanwhile, Muhammad Hamdan said Sultan Nazrin expressed sadness over the incident that occurred to Muhammad Adib. “During the visit, the sultan said that he was sad over what had happened and he also prayed for Muhammad Adib’s speedy recovery,” he told a press conference in Kuala Lumpur today. Muhammad Hamdan said specialist doctors and medical officers at IJN were working hard to provide intensive treatment to Muhammad Adib.